You can make your awnings more cozy with lighting accessories. If you’re planning to enjoy a lovely summer evening beneath your awning, you’re going to need to illuminate the space. Good lighting makes walkways easy navigate in the dark, and provides safety, security, and a welcoming ambiance. Here’s a quick look into some of the best options for lighting your patio and awnings. Bright, standard-voltage lights are great for under-eave porch lighting or as a post light, and will serve to repel intruders from your property. However, these lights are too glaring for entertaining guests. Low-voltage lights create a more relaxed atmosphere that’s just bright enough for most evening activities. It’s important to make sure that your lighting choices are appropriate for the setting. A combination of both lighting types, or an adjustable dimmer is an ideal solution. There are a wide variety of lighting options you can choose when illuminating the space beneath your summer awning. Flood and skylights will provide maximum coverage for your area, and are also great for warding off intruders. Lantern and globe lights provide a lot of lighting while adding a more whimsical quality to your atmosphere. Roper or “string” lights, are the kind of lights we’re all familiar with from Christmas and Halloween. 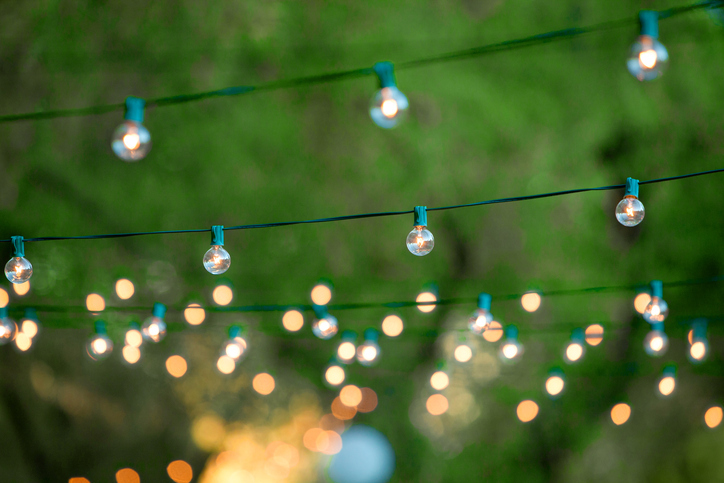 Although these lights are tiny, they can be hung in a variety of ways to add personality and color to your space. The way you position your lights matters a great deal. You will want to provide illumination that brings out the features of your home without shining it into people’s eyes. A good idea is to place low-voltage lights lower than 2 feet above the ground and standard-voltage lights higher than 7 feet. Barriers and shielded fixtures can also give you a more diffused light. Point lights downward to gently light up your patio and accent the surroundings. Ready to enjoy the summer breeze beneath your awning? The Carroll Awning Company provides the best quality, energy-efficient canopies, awnings, Sunesta shelters, and frames for any business, restaurant, home, or apartment. We design, create, and install custom-created canopies and awnings all year round!